San Antonio runs a "Council-Manager" form of government. Voters elect 10 district representatives and a mayor to pass laws and establish policies they feel are in their best interest of the community. The current elected City Council and Mayor are the main decision and policies makers focusing on district and financial growth, economic development, land use and development, and much more. The City Council hires the City Manager, the City's Chief Administrator, who is responsible for carrying out the actions and policies set by the City Council. City Council often looks to the City Manager for professional advice before taking action on certain issues. The City Manager is responsible for developing and overseeing an annual budget to be approved by the City Council such as police and fire departments, elderly care, recreational and cultural activities and social and economic policies. 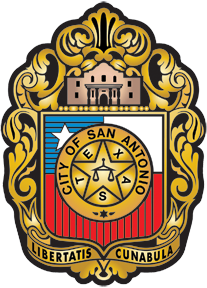 The Official City of San Antonio website has more detailed information about the city's policies and organizations. The City of San Antonio's Office of Sustainability develops and implements municipal environmental programs and policies to improve environmental quality and reduce energy consumption. In early 2004 Bexar County Commissioners Court created the Energy Management Program (EMP) to reduce the county's overall energy which is administer by the Facilities Management Department.